The Files view represents the structure of the files that make up the current software system . System File: Named as "system.sonargraph", represents the current software system. Analyzers: Contains available configuration files of analyzers. A double click opens the corresponding configuration page. Alternatively the configuration pages are reachable via "System" → "Configure...". Architectural Views: Contains architectural view models. Architecture: Contains architecture files. A new architecture file can be created using the context menu of the "Architecture" folder. 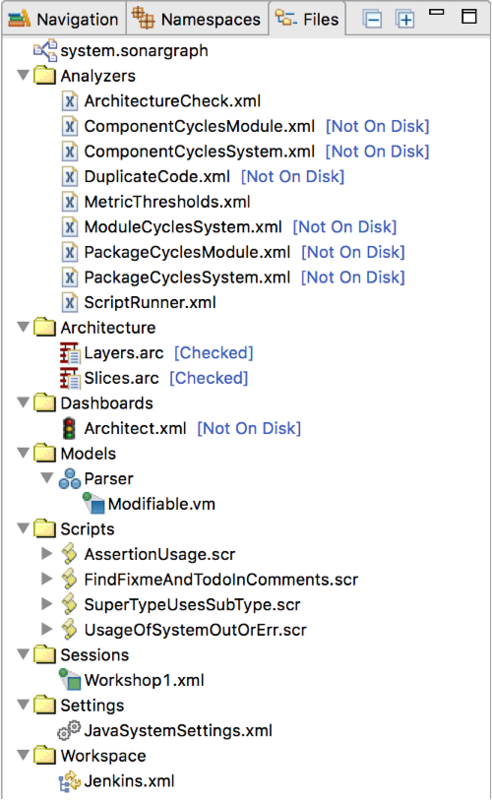 Existing architecture files can be added/removed from the architecture check also via their context menu. Dashboards: Currently, the file underneath is not modifiable and the content shown in the System view is fixed. In the future, the content displayed in the System view will be configurable. Models: Contains virtual models of the current software system (see Section 8.1, “Using Virtual Models for Resolutions ” ). These files only get modified when altering the set of resolutions and/or refactorings. Plugins: Contains plugin configuration files. Scripts: Contains scripts that can be executed for the current system. Those scripts have been added by either using a quality model (see Section 5.1, “Quality Model” ) or they have been created manually (see Chapter 12, Extending the Static Analysis ). Settings: Contains language specific settings.